Protect your expensive eyewear in style with these classic slip in eyeglass cases from Ron's Optical. Simply slip your reading glasses or any other medium sized eyewear into the case, and you're done. No zipping, no snapping, just slip in and go! Each case is lined with a plush padded styrene to protect your lenses from scratches and scuffs. Choose your favorite look and color from our extensive variety of patterns, or buy multiple styles and colors to match any outfit or mood! 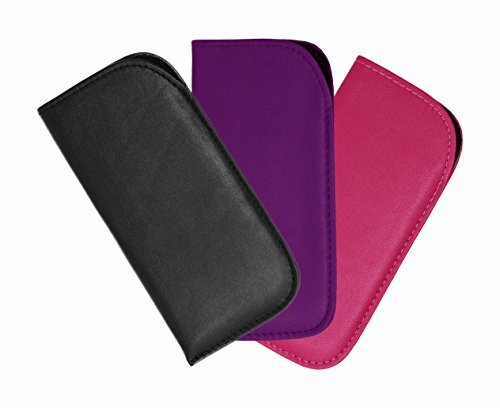 This listing is for a 3 pack of faux leather slip case, one in black, one in purple, and one in pink. These simple yet highly functional cases are extremely slim, so they will fit easily into any purse, bag, or even a jacket pocket. Each quality eyeglass case is hand packed with care in Dallas, Texas. DURABLE SOFT CASE for glasses stands the test of time. Protective eyeglass case without the hassle and weight of a zipper or snap. Just slip in your glasses and go!